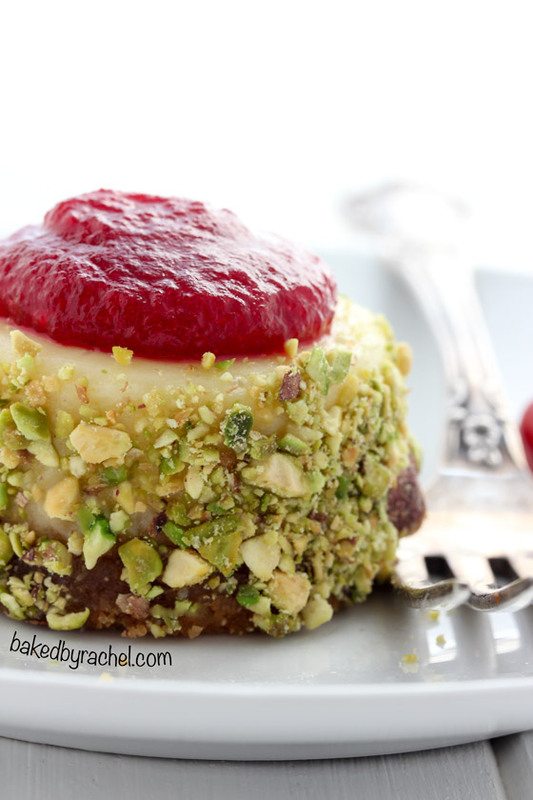 Mini cheesecakes coated in chopped pistachios and topped off with a tart cranberry jam. A festive two bite dessert, perfect for the holidays! Do you ever feel like you need a vacation from your vacation? That’s exactly how I feel after our long weekend. It’s not even like we did any significant traveling. It was a pretty low-key weekend… Thanksgiving with family, setup our tree and enjoyed some Christmas movies. But between all of that, I got nothing done. Partly by choice and partly due to seriously gloomy weather. Now I have to readjust back to normal life. Here’s to hoping this week is productive! Speaking of the tree… We have a tradition of watching Elf when we set our tree up every year. I like having traditions. There something to look forward to and remember years down the road. This year, the Mr and I sat back and let the kids clean the house (including moving furniture!) all to prepare for the tree! It was fairly comical and also relaxing. One of the things I hate most about decorating is all of the prep work and cleaning that goes along with it. With their help, it definitely made putting things up a lot easier this year, and less stressful! They were so eager to have it up, so we figured why not! Hopefully they’re that eager to help when it comes time to put it all away! I’m a huge fan of mini treats, as you may or may not have noticed. And, I love super festive food for the holidays, especially desserts. They just have a way of making parties and celebrations extra special. The great thing about these mini cheesecakes, is that you can eat one or a few and feel less guilty about it. Finger food has a way of doing that. 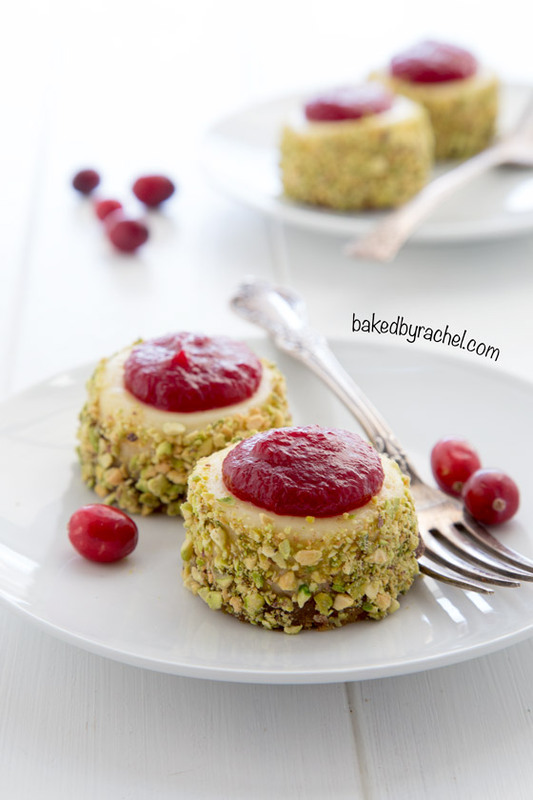 Easy creamy mini cheesecakes, coated in chopped pistachios and topped off with tart cranberry jam! A festive two bite dessert, perfect for all of your holiday parties! In a food processor, combine crust ingredients. Divide mixture among prepared cheesecake cavities. Add 1 small cookie scoop of crust mixture per cavity. Press down firmly to create an even layer. Bake for 5 minutes. In a large bowl or stand mixer, beat together softened cream cheese and sugar. When smooth, mix in sour cream, vanilla and salt. Finally, add in egg, mixing until just combined and no streaks remain. Add one heaping medium scoop of batter to each pan cavity. Bake at 325°F for 15-18 minutes. 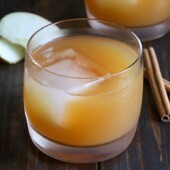 Cool in pan to room temperature, then transfer to the refrigerator to chill thoroughly, roughly 6-12 hours or overnight. When ready to proceed, carefully remove cheesecakes from pan, removing pan discs from the bottom of each crust. Add finely chopped pistachios to a small bowl. Microwave honey for 10 seconds. Using a pasty brush, lightly coat the sides of a cheesecake with honey. 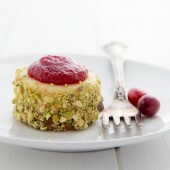 Roll coated cheesecake in chopped unsalted pistachios. Repeat with remaining cheesecakes. Add cranberry jam to a pastry bag or plastic bag fit with a round tip. If needed, warm jam to soften prior to adding to bag. Pipe cranberry jam to the top of each cheesecake. Chill cheesecakes until ready to serve. I don’t have a mini-cheesecake pan, Rachel, but now I want one. These little bites are elegant and delicious! I love your mini cheesecakes! I’ve been waiting for a new one and was so excited to see this salty sweet bite in my feed this morning! It’s perfect for holiday parties! I love the salty-sweet combo of pistachios and cranberries! This sounds perfect and looks so Christmas-y! Jealous…I wanted to go cut down a tree so badly this weekend but work at the rental house took priority (much to my annoyance). Can I borrow a few of your kids to come help with the process when we do get around to it? The cleanup and prep work is the WORST part of it all for sure! On another note, these little cheesecakes couldn’t be any more perfect if they tried! These cheesecakes are SO adorable! I could just pinch them. Seriously!! Oh I need to bust out my mini cheesecake pan it’s been too long. THese are beautiful. 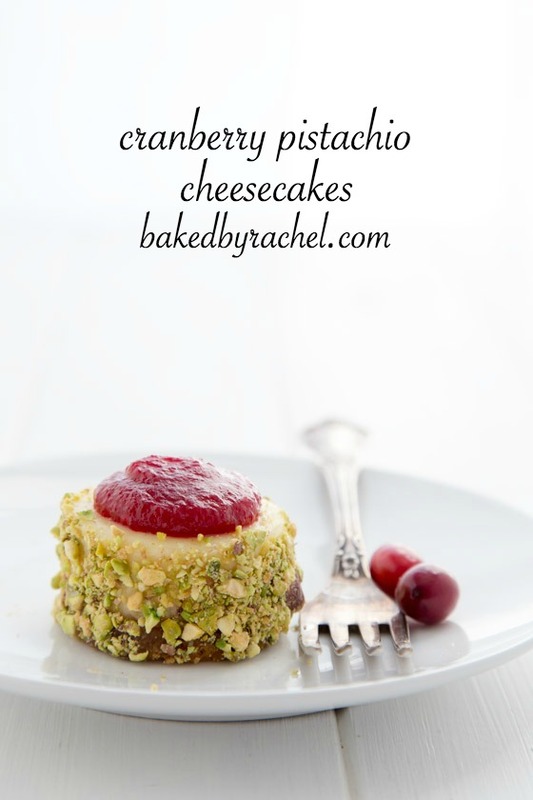 I absolutely love that pistachio crust around the cheesecakes! I can’t believe I still don’t have a tree yet. I don’t even have lights, come to think of it! I hope your kids are just as eager putting the decorations away! Thanks so much Lisa! Haha here’s to hoping they are willing to help packing it all up! These look so good and perfect for Christmas!! I have yet to put up my tree. I don’t mind putting up the decor but I hate putting it away, it seems like such a chore at that time. Putting it away always feels horrible. I think we need to come up with a game to make it more entertaining and less draining. 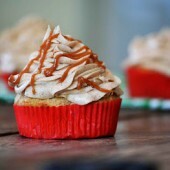 This little sweeties looks delish. 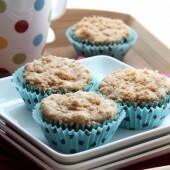 I love the recipe, thanks for sharing!